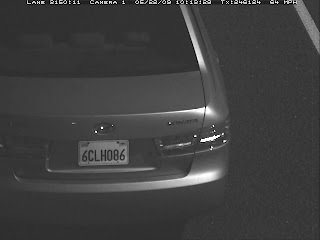 Who are these criminals in a get-away rental car? Could it be Kira and Reuben? Mr. Schwarzenegger seems to think so. Arnold seems to think they are participating in a little toll evasion. You be the judge. Personally, the author doesn't think there's enough proof to nail anybody. Certainly, Reuben and Kira don't remember running through any tolls ... but then again, Reuben is often absent-minded, and Kira is often sleeping. Those pictures show no evidence of it being either of you. 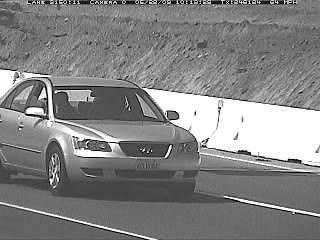 I just got caught by a traffic camera as well, but it was clearly me- on my phone, too.